This card is for those who frequently visit a construction site, but have no construction specific skill. This card is issued on a personal basis via the application form; you will need to take and pass the CITB Operatives Health, Safety And Environment Test. 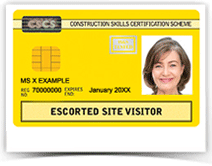 To apply for the YELLOW CSCS CARD please click here. Please note: the issue of this card does not relieve the site managers from their legal obligations to ensure the health, safety and welfare of people entering their sites.